The "Dune Climb Stairway" at P. J. Hoffmaster State Park is no easy climb. It's 193 steps to the end, a viewing platform on top of a dune, 190 feet above the lake. So tiring is the climb for some people that the park staff has built benches along the stairway. No easy stroll but a magnificent view. From the observation deck there is a panorama of Lake Michigan and its shoreline beach, but most of all there are dunes, almost every which way you look. Well forested or wind-blown, these steep hills of sand make up the majority of Hoffmaster's 1,200 acres. Most visitors know they are viewing a portion of the worlds most extensive set of freshwater dunes but don't realize these are among the youngest geological formations in Michigan, formed only 3,000 years ago and constantly changing in appearance, size and their effect on the environment. 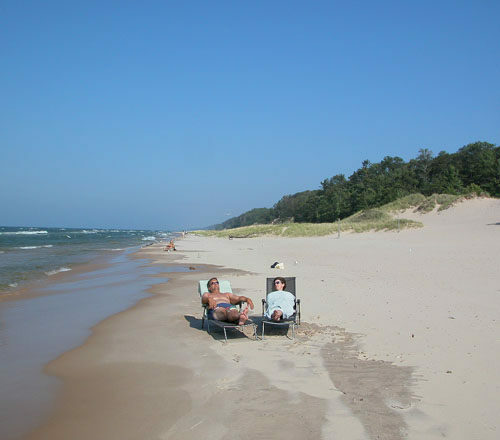 Michigan's sand dunes are perhaps its greatest natural treasure, and there may not be a better place to witness them or understand their natural history than Hoffmaster State Park, just south of Muskegon on the southern edge of Muskegon County. The park’s trail system allows visitors to view the entire plant succession of dunes, from the beach along Lake Michigan to pioneer dune grass and foredune country to the barrier dunes with their white pines and black oak forests. 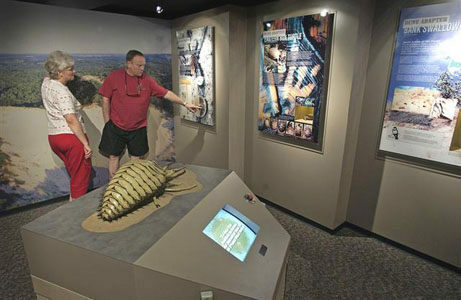 There is also Gillette Visitor Center, an interpretive center within the park, devoted to the state's sand dunes. 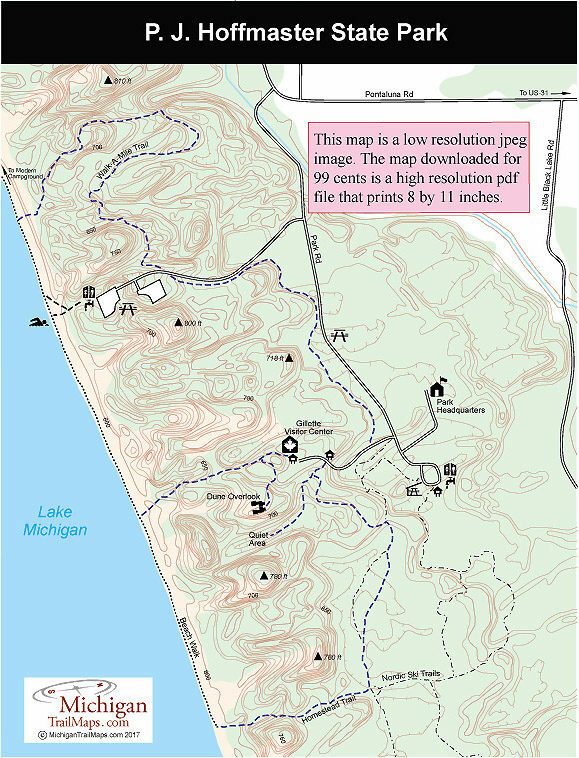 More than 10 miles network of foot trails loops through the park's dunes and along most of the 2.5 miles of undeveloped Lake Michigan shoreline within its borders. The network basically forms a large loop stretching from the campground on the northern end to almost its southern border with several spurs cutting across it. There are several trailheads to the loop located at the campground, the day-use beach area and the Gillette Nature Center. The interpretive center is a popular place for many hikers to start the day as several trails begin here, including the Dune Climb Stairway, a half-mile trail to the park's designated quiet area and a 2.7-mile loop that includes the Homestead Trail and a stretch along Lake Michigan. 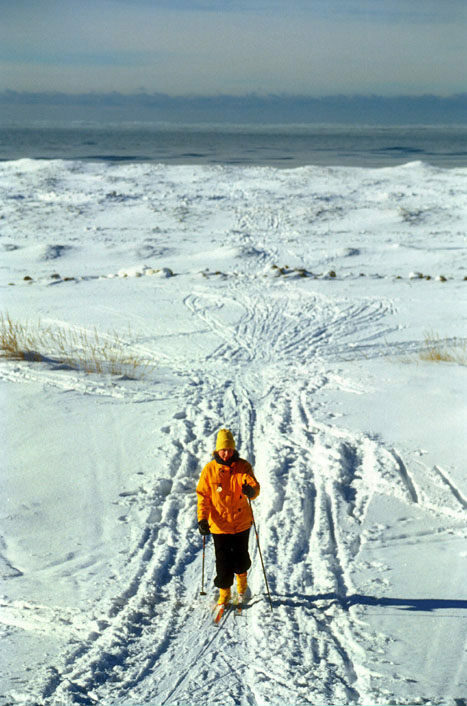 Mountain biking is not allowed on any of the park's trails but Nordic skiing is a popular activity in the winter. Hoffmaster maintains 3 miles of ski trails with a trailhead and parking, lot at the south end of the park road. The trail forms three loops through rolling to hilly terrain with runs rated for novice to advanced skiers. The trails are not groomed, nor is there a ski rental concession on site. Hoffmaster has a modern campground of several loops with 293 sites. The area is well forested with pine trees towering over every site and sandy floor covered with needles. A quarter mile trail leads from one loop west to a camper's beach on Lake Michigan. On a clear evening campers head down the trail to sit on the sandy bluffs above the beach and watch the sunset, applauding afterwards at Mother Nature's nightly performance. Hoffmaster maintains a day-use area on Lake Michigan with parking for 550 cars. The facility includes a bathhouse, concession store and a picnic area near a beautiful stretch of Lake Michigan beach. The facility is heavily used in the summer, and occasionally the lot is filled on the weekend. Further south, along the park road toward the nature center, there are other picnic areas situated in a wooded setting. The Gillette Visitor Center (231-798-3573; www.michigan.gov/gillettevc) was built in 1976 as a bicentennial project to serve as an interpretive center to the state’s most noted natural treasure. The two-story center is literally overshadowed by a huge, windblown dune that can be viewed from a glass wall on the west side of the lobby. The center features a hall entitled “Michigan Coastal Sand Dunes Like Nowhere Else on Earth” in which dioramas depict the four dune habitats, including models of the animals, plants, trees, even the sounds of waves and birds in the background. Nearby is an animation station that shows how sand dunes are formed. There is also an 82-seat theater that uses a nine-projector, multi-image slide show to explain further the dunes’ delicate nature and the reason the state has moved to protect them from over development. Gillette Nature Center (231-798-3573; www.michigan.gov/gillettevc) is open from Memorial Day to Labor Day from 10 a.m. to 5 p.m. Monday through Saturday and noon to 5 p.m. Sunday. There are reduced hours the rest of the year. There is no fee to visit the interpretive center, but there is a vehicle fee to enter the park. From I-96 depart at exit 4 and head south on 148th Avenue and then immediately turn west (right) onto Pontaluna Road, which ends in 6 miles at the park entrance. From US-31 depart at Pontaluna Road, almost halfway between Muskegon and Grand Haven, and head west for 3 miles. For more information contact P. J. Hoffmaster State Park (231-798-3711).